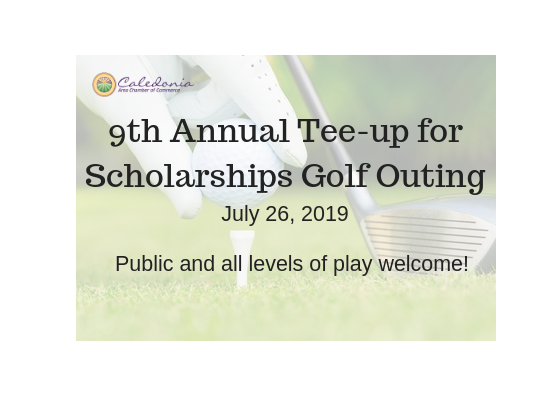 The Caledonia Area Chamber of Commerce is proud to host its 9th Annual 'Tee-up for Scholarships' Golf Outing on Friday, July 26, 2019 at Saskatoon Golf Club. This outing is designed with everyone in mind, offering both competitive and fun course events throughout the day; everyone is welcome! The Tee Up for Scholarships golf outing is the sole fundraiser for the Caledonia Area Chamber Scholarship program, awarding scholarships to eligible students attending Caledonia High School and South Christian High School. As a participant, you help make a difference in the life of a local student! Download Golf Outing Brochure here. To pay for your registration via Credit Card, click here.